Peas + salt + time = pickles! Ever meet a dilly bean you didn't love? Well, you can pickle peas, too. One of my girlfriends made lactofermented snap-pea "pea-kles" last summer, and they're still flavorful, crispy and sour a full year later. So, with a few pounds of extra sugarsnaps on my hands, I threw some into jars with fresh onions from Cedar Circle Farm, a little wild chamomile (also called pineapple weed, this grows all over my driveway, and in compacted soils everywhere) then covered them in salty maple brine. Lactopickling is super simple — my pea-kle ordeal took about 30 minutes including boiling and cooling the brine — but it's critical to follow a few important rules. First, use the freshest, fresh-fresh produce. Lactopickles happen when "good" ambient bacteria digests the vegetable sugars, creating lactic acid in the process. That acid gives the pickles their sour character. It also extends their shelf life. For the record, I've tried to ferment half-rotten, funky old produce and, lemme tell you, the "bad" bacteria, which is already well established on old, janky produce, takes over the whole jar. It's gross. Don't try it. Also, since the goal is to create an environment where the lactobacteria will thrive, you want to minimize the number of competing "bad" bacteria inside the jar. Use clean jars and lids. Sterilize them first, either by boiling them in hot water or soaking them in a bleach bath. If using bleach (easier/quicker than boiling, IMO), rinse, rinse, rinse until all the bleach odor is gone, and then some. No, your rinse water probably isn't sterile. But it's clean enough. Make sure all the peas (or whatever you're pickling) are completely submerged in the brine. Exposure to air can send the whole process into a tailspin. Again: moldy pickles! Once everything's submerged in the jar, put a lid on it and allow to ferment at room temperature for five to seven days. Keep an eye on the jars: Within a day or two, you'll see bubbles starting to form. Open the lid gently to "burp" the jar, or release the gas created during fermentation. It may bubble or fizz a little — that's what you want! Repeat as often as you think of it (daily, at a minimum), and check to confirm that everything's still submerged. Use a clean piece of silverware to push down any floaters. Or a sterilized, nonreactive rock works, too. And, yes, it'll smell funky. My husband calls it the "foot odor" smell, but I liken it to sulfur and a little sour. After a week, transfer the jars to the fridge. Let rest another week or so and enjoy! Place water, salt and maple syrup in a saucepan and bring to a boil. Cool to room temperature. 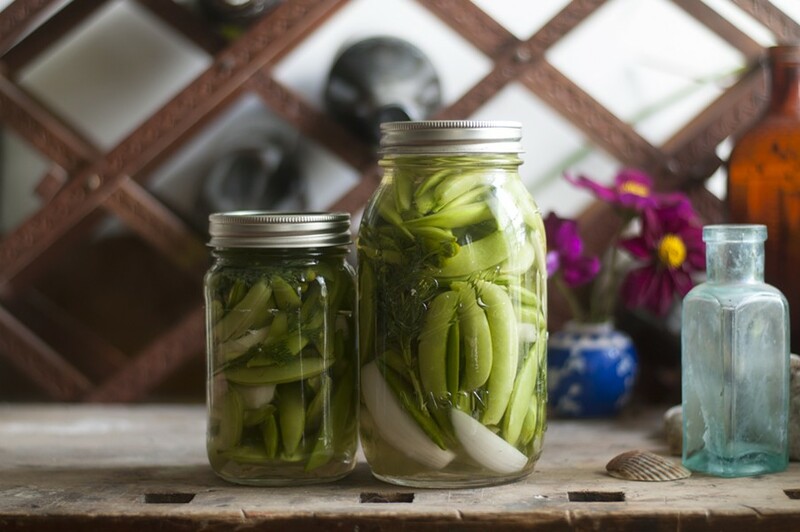 Place snap peas, onion and chamomile in the jars and pour cooled brine to cover completely. Lid the jars and place in a cool counter or table away from direct sunlight 5-10 days. "Burp" jars daily for the first week, then as needed after. Transfer to the refrigerator and enjoy. They'll keep for several months and get more pungent until they're gone!